A 22-year-old man was reported missing Thursday after he was last seen over three weeks ago in the Austin neighborhood on the West Side. CHARLESTON COUNTY, SC (WCSC) – Charleston County deputies are asking anyone with information on a missing 33-year-old man to come forward. Authorities have been searching for Nathaniel Anderson since Wednesday. Family and friends are trying to find a Salina teen who has been missing since Friday. 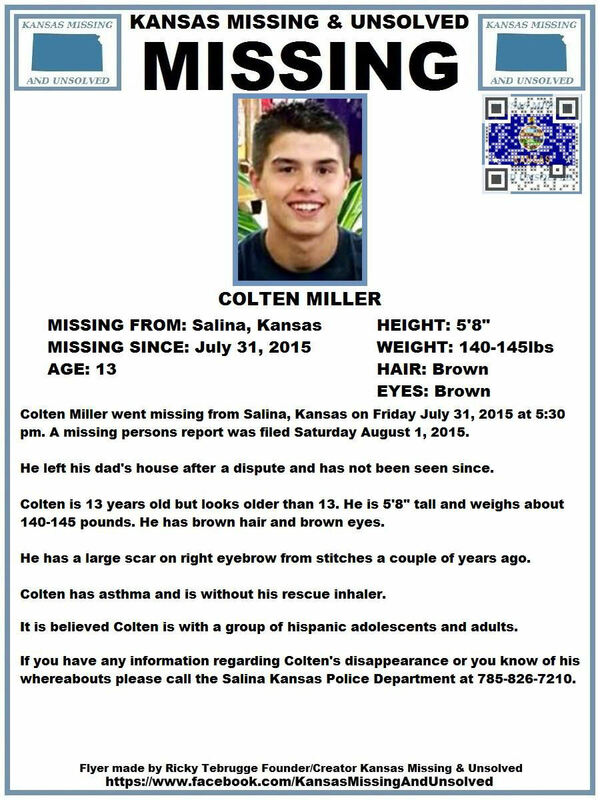 According to Kansas Missing and Unsolved, 13-year-old Colten Miller went missing from Salina on Friday, July 31st. He was last seen at 5:30 that evening. A missing person’s report was filed the next day. Salt Lake City police have issued a missing person alert for an elderly, ailing African immigrant who does not speak English. The 74-year-old woman, Dancelle Mukandekezi, was reported missing from her apartment at 341 E. 800 South late Wednesday. Deputies are asking for the public’s help to find twin 15-year-old sisters who vanished last month and may be in South Florida. Rebecca and Renata Erazo-Carvalho live with their father and were last seen at their residence in St. Cloud at 1:30 p.m. April 25. SALT LAKE CITY (ABC 4 Utah) – A 13-year-old girl from Salt Lake City is missing. Ana Martia Ortega is a North West Jr. High student. she was last seen Monday at 7:50 a.m. She is 5’3″ tall and weighs 176. She has brown eyes and dark brown hair. She has asthma and takes albuterol.